The Indian selectors have announced the 15-man Indian squad for the ICC World Cup 2019 that is scheduled to commence from 30th May in England and Wales. There are a couple of surprising picks in the squad; you can check out the full team here. The most surprising decision was the inclusion of Dinesh Karthik as the team's back-up wicket-keeper. 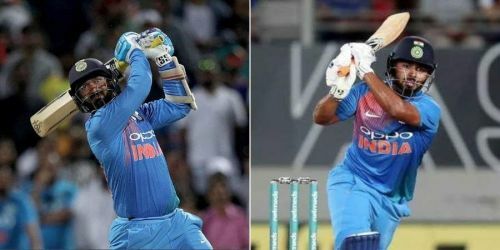 Many fans expected the young Rishabh Pant to take that spot instead of Karthik, but there could be a logical and long-term reason why the Indian selectors did not include Pant in the team. The most important thing that a team needs to win a World Cup is experience of playing in the conditions where the event is being organized. Now, Pant has never played an ODI match in England and Karthik has represented India at multiple ICC events organized in the UK. That is a factor that is too hard to ignore. Karthik may not be a hard-hitter like Pant but he is a far safer option behind the stumps. England is likely to offer a bit of swing to the fast bowlers; if Dhoni misses out for any reason, then Karthik will be well-equipped to keep wickets in those conditions. The selectors did mention during their announcement that Pant has immense talent. And given that Dhoni's days in international cricket are numbered, we can expect the selectors to play Pant regularly after the World Cup. The next three ICC events i.e. the 2020 T20 World Cup (Australia), the 2021 T20 World Cup (India) and the 2023 ODI World Cup (India) will be held at the venues where Pant has immense experience of keeping wickets. It's reasonable to expect he will get chances to play many matches in those tournaments. Thus, Pant fans should not be too disappointed with this decision. The 21-year-old star can certainly be expected to don the Indian colors in the next three global ICC events. As for Karthik, the selection is also just reward for his solid performances with the national team in recent times. His fans would be hoping that he gets enough chances in the playing XI at the World Cup, and that he makes the most of those chances.